So much about addictive behaviour (particularly binge eating) is about trying to fill or numb the fact that we don’t feel FULL. We grasp outside of ourselves for the solution to our distress, to find love, or to find relief from our perceived seperateness from love. We take our search for love to the streets, knocking on doors see if there’s someone who will answer to let us know we are worth loving, when in fact, we don’t even need to leave home to experience love. If we stayed “home” (read: in our hearts) long enough, we would discover our inner wellspring of love, overflowing and eager to be channeled from our hearts and out into the world. When it comes to romantic love, there’s a huge misconception out there that “the other” is responsible for making us feel loved — that without “the other,” we will not experience love, and that if someone does not love us, we must not be worth loving. What if I told you that whenever we experience the love of another person, it is really just the other person reflecting back the love that lives inside of us? The recipe for inner peace is simple: Connect with your love essence, your true nature. Realize how full you truly are. And then share that love with the world. My first experience of renowned raw food chef Juliano was at his restaurant in Santa Monica. There, I saw him in the raw flesh (haha). I also saw him in the numerous oversized posters that hung on the walls of his restaurant, looking intense and determined on his raw food mission. The dynamic in the kitchen was equally tense and determined. Raw food didn’t seem like it was supposed to be much fun. But then I found this recipe, the bliss child (or distant relative) of this very man. And now that same intensity and determination that I took for pretentiousness is suddenly a marker of a man dedicated to the cause of bringing bliss to the masses; I can’t help but love him. One bite of these “Spheres of Bliss” (as my one friend coined them) and you will be lining up outside of Chef Juliano’s door just to bow at his feet. Thank you to Alicia Silverstone, a chef Juliano insider, who shared her version of his recipe in her book The Kind Diet. Process walnuts in food processor until coursely ground, then add dates and whiz until combined well. Add the rest of the ingredients (except the almonds and coconut) and process until thick and smooth. Add almonds and pulse until they are combined but still chunky. 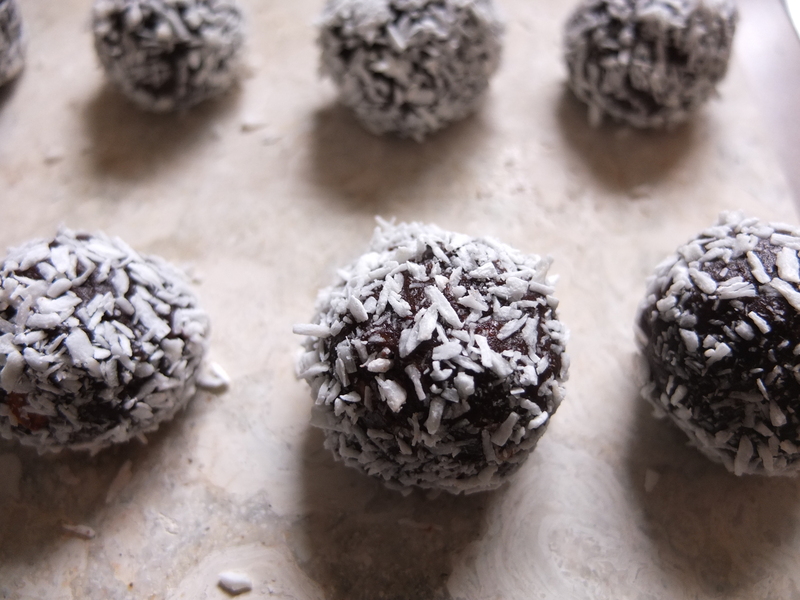 Roll into golf-ball sized balls and then roll in coconut. Place in freezer until hardened and store in air tight container. Eat when you need a little LOVE reminder.